Guillaume Soulier. Founder and CEO of PRS. 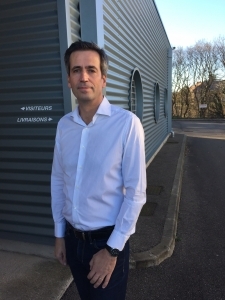 A graduate of top French business schools, Guillaume Soulier held several positions as sales representative at Kodak, and later served as Regional Manager at Toshiba Medical. In 2003, he founded Neoscan Medical, specializing in the sale of all brands of refurbished ultrasound devices for the export market. In 2008, he set up PRS, a laboratory specialized in repairing ultrasound probes, pioneering a market that was previously unknown in France. Our technicians and engineers are highly experienced professionals. This enables us to offer a full range of repairs, from the simplest to the most complex, on 2D, 3D, 4D and transesophageal probes. Our sales department is organized to quickly process your request. Our sales representatives throughout France are ready to help you with any need. With its laboratory based in Lyon, PRS is France’s leader in the repair of all brands of ultrasound probes. Certified to ISO 9001 and ISO 13485 standards in 2013, PRS has grown thanks to significant investment in 3 areas: human resources, an R&D department that enables us to offer new types of repairs every day, and cutting-edge technology. PRS’s clients include many hospitals in France and abroad. Fast response, growth, reliability and service are at the heart of our quality policy. We hope you will soon be among our many loyal customers. nec elementum Sed elit. risus. ipsum venenatis, efficitur.